Figari is the inland village in the extreme South where you fly into. 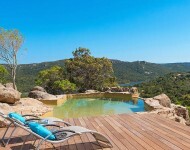 Surrounded by nature and rolling hills, you are within easy reach of cosmopolitan Porto Vecchio to the north or the natural harbour and cliff-hugging town of Bonifacio. Also, within a short drive are a selection of carribbeanesque sandy beaches which are the envy of Europe.